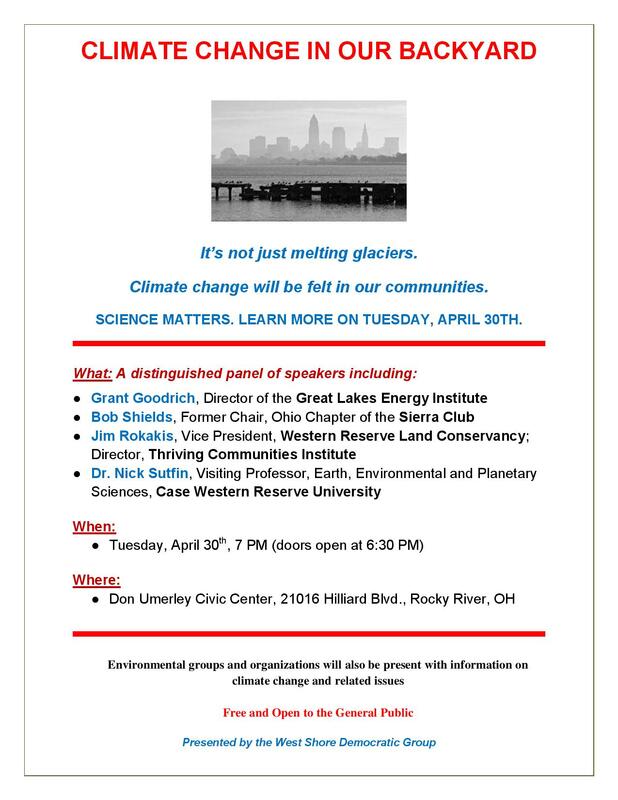 Climate Change Meeting on Tuesday, April 30, 7 PM! The Speakers will update the community on a number of issues. The session will include ample time for audience feedback and questions. The meeting is free and open to everyone. Please invite your friends and neighbors! Angela Dudek, Executive Director, will review how the Rocky River Chamber of Commerce works and what is new and exciting in 2019. Anastasia Vanisko, Program Assistant, will discuss the setback requirement for wind farms that has severely restricted their spread in Ohio and provide concrete action steps for the audience. Ohio Citizen Action engages people in actions that protect public health, improve environmental quality, and benefit consumers. Rick Hatala, Club Secretary, will present the results of the survey conducted by the Club last month. Highlights include responses to what respondents felt were important at the local, state, and national levels. Mike O’Neil, Club President, will preside over the election of Club Officers for the next two-year term that begins with this meeting. Hear from 3 quality candidates on what it takes to run for the first time at a municipal level, state level and national level. Lessons learned and great advice and tips. Our local election takes place this year in Rocky River for mayor, city council and other offices. During the meeting, Club Treasurer Rob McRae will provide an overview of Rocky River’s political structure. Election of Club officers will also be discussed. Nominations are made in January and February; and voting takes place during the Club meeting on February 26th. If you have an interest in a role with the Club, we encourage you to participate! 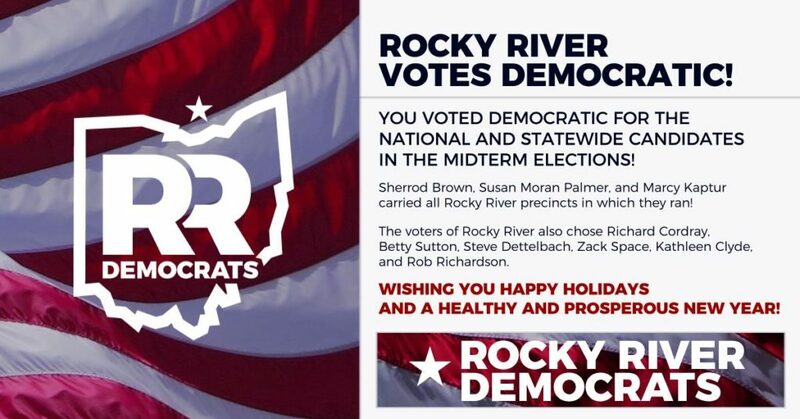 The Rocky River Democratic Club is the place to connect to campaigns, issues and causes right here in our own community. Protect Ballot Initiatives and the Right to Peaceful Protest! 2) Senate Bill 250 would elevate criminal trespass charges to a felony, e.g., environmental protesters at a natural gas pipeline. Please read the LWV message below and click links for additional information. The bottom line is — please call the following Representatives to voice your opposition and protect your rights. Our vigilance and action is needed now more than ever. Please see below for more details. HJR 19 is moving quickly through the state legislature and will likely be voted on by the house by the end of this week. There is lots going on with a press conference tomorrow, letters being circulated to organizations and calls to action on social media as well as an online petition. Link to Toolkit for protesting Call numbers, articles and petitions! Advocacy is an important part of the LWV mission statement. We support the local, state and national LWV by advocating for our weii-informed public policy positions. The public needs the League’s fact-based approach to advocacy on issues ranging from environmental protection to government procedures. Getting ready for the municipal election in 2019: recruiting good candidates for all city offices, including City Council and School Board. Check in items at the registration table when you arrive. If possible, please let us know what auction item you will be bringing, so we can have the sign ready for the table.